how does Living Death with Soul Warden work? Each player exiles all creature cards from their graveyard, then sacrifices all creatures they controls, then puts all cards they exiled this way onto the battlefield. You have uploaded a lot! Naturally this deck nodded to Lion King so I had to check this one first. This deck looks like derpy mono black good stuff and I am liking it a lot! Read the Bones and Living Death might be good here. If you want to be mean, Sheoldred is a good option. Looking through your deck I think for the most part it looks doable. There's a few things I would recommend cutting to kind of lower the CMC of the deck, as i noticed you've got a somewhat low land count, along with some cards I feel like are zombie traps. Firstly, Butcher of Malakir is just too expensive. If you still want that effect, I'd highly suggest either Grave Pact or Dictate of Erebos , as they're cheaper and harder to remove. Army of the Damned is something I see in a hell of a lot of zombie decks, but I never feel like it's ACTUALLY any good. Sure, 13 2/2's is nothing to scoff at, but it's so mana intensive and they enter tapped anyway that it just feels like a trap. Unless you've got a way to cheat the cost, I'd suggest trying something else - Reanimate , Unearth , Living Death , etc. Besides, I think Josu Vess is better for that kind of thing, since his horde has menace and is untapped. Endless Ranks of the Dead is only situationally good from my experience. It's just a little too slow for me to ever really do much with it. Empty the Pits is another I'm not too crazy about. Admittedly, self milling can make it do some work, but overall I feel like it's too expensive UNLESS you've got a good GY built up. Unearth - this beauty is so synergistic with a zombie deck. 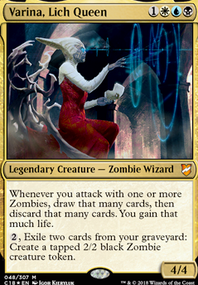 The biggest problem for zombies in a 60 card format is that all of their lords are at the 3 CMC cost. 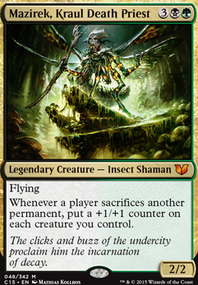 In EDH we can run them all, and hey, surprise surprise, they're all targetable with this spell! Reanimate - Basically a second Unearth, but without the 3 CMC restriction. Flash and Rot Hulk is a pretty disgusting combination. You flash in the hulk and don't pay it's cost and since that's technically part of the resolution of the Flash spell, Hulk's ETB won't trigger until after he's in the graveyard in this instance, meaning you can target him with his own ETB, getting back it and two other zombies, then on his second ETB getting back another three zombos. All at instant speed! Living Death - Highly, HIGHLY suggest this one. It's both a boardwipe and a finisher, all in one. Plague Belcher - basically an extra blood artist effect, effectively a second Diregraf Captain . Tombstone Stairwell - THis one is a finisher in my deck. A better version of Endless Ranks of the Dead , but with the added benefit of sooooo many death triggers that if you've got a Diregraf Captain or Plague Belcher out, you'll probably win the game shortly after. 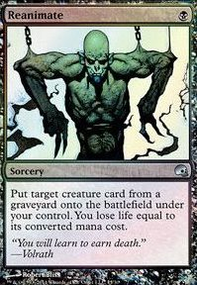 Whip of Erebos - Lifelink is underrated in black, and being able to reanimate anything in your GY for a burst swing is super nice. Phyrexian Altar AND Ashnod's Altar - Both of these are great. 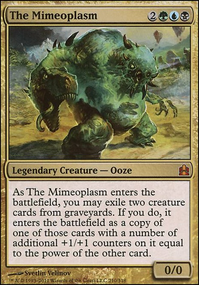 Not only do they ramp, but with certain boardstates they go infinite for a combo win - Classics like Gravecrawler , Phyrexian Altar , and Diregraf Captain will drain the whole table pretty easily. Nim Deathmantle - If you're running Ashnod's Altar , you should run this. This can EASILY lead to some infinite combos (with Ashnod's, this, and, say, Grave Titan you've got infinite zombies and also infinite colorless mana). Bontu's Monument - There's probably a combo hidden with it, but cost reduction and incidental lifegain is always nice! Talisman of Dominance - I like it better than the Dimir Signet, but running both will give you a little bit of ramp at least. Graf Harvest - If you're going the combo route you probably don't need this but if you're wanting to just swing, this 1 CMC enchantment does some work in an aggro shell. Gadianten: Finale is expensive and I never really bother with other people’s yards unless it helps me combo or advances the board state. Balthor is kind of neat, like a backup Living Death , but if I want to use him right away, he’s expensive and only usable once, so he probably won’t make the cut. 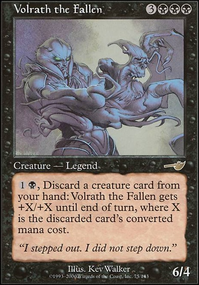 Morality Shift is cute and I have thought about other decks built around it but I haven’t made the time recently. It’d be bad here. My initial reasons for not running Buried Alive is that it’s kind of a clunky Entomb and it’s super threatening. Entomb can be super threatening as well but it’s so much faster. Setting up 3 cards would be sweet but I think it’s not good for politics. Hey, can't get much better than Rats and Angels :) Consider more Rat Colony? 20 seems good, haha. Mogis's Marauder : there will be lots of black devotion with Rats, this guy can give all your Rats haste and you choose which ones get haste. Win from out of nowhere. Crypt Ghast : pretty much a staple when playing so many Swamps. Extort is some extra opponent life lose and life gain for you when casting Rats. Thrumming Stone : expensive price card, ripple 4 is amazing with Rat Colony. Living Death and Patriarch's Bidding : reanimate all Rats. Mikaeus, the Unhallowed : anthem and give all Rats undying. When you sac a Rat it's reanimated. Basilisk Collar : equip to Crypt Rats, kill all your opponents and not yourself. Dark Prophecy : draw when you sac Rats, works with tokens. Jet Medallion : make all Rat Colony only cost one mana. Insidious Dreams : discard your hand to tutor for and setup the top of your library with all Rat Colony.